This is a Polaroid, probably taken by Joan’s father, Donald Nelson. 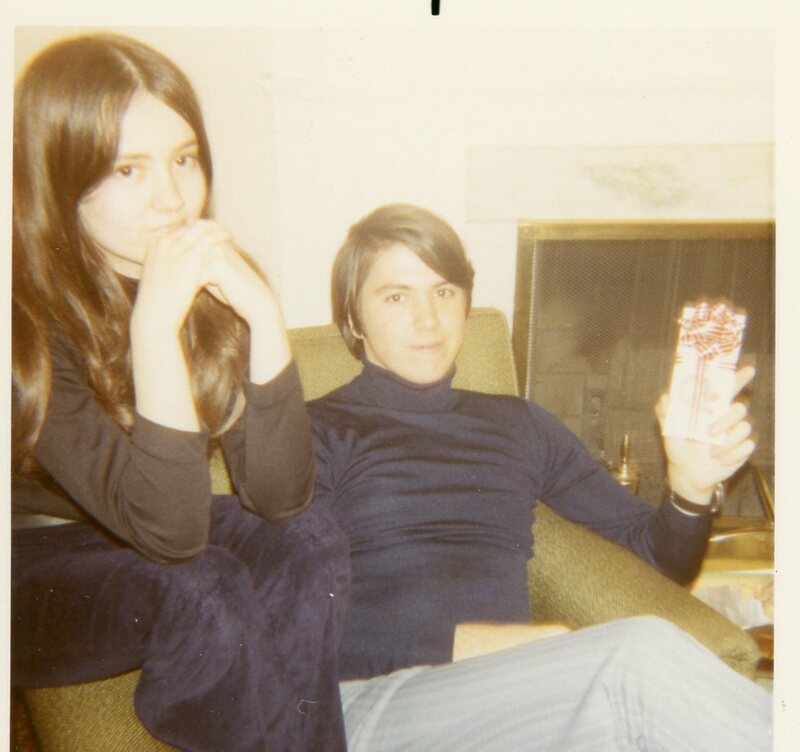 It captures Joan and Greg in a candid moment at Christmas time in 1971. We were in Pittsburgh at Joan’s parents’ house, just a few days before we were married on December 29th.When we look in our photo albums for photographs of our early days together, we realize how few images have really been preserved. If it weren’t for Joan’s father, we wonder how many pictures we would have of this time in our lives. When we think about the many photo albums inherited from Joan’s parents, we realize that Don Nelson was quite a dedicated “chronicler” of the lives and times of the Nelsons and the Shreves, and we are grateful to him for it. We had cameras, of course. And it isn’t that we don’t have pictures from our early years together. We just don’t have that many; or really, we should say we don’t have as many as we would like looking back through the lens of 40 years. Today, with digital cameras and cell phones it is so much easier to capture and preserve the moments of our lives as we move through them. In the digital age the problem isn’t too few photographs, but, one could argue, too many. We document our lives in minute detail with our emailed and texted images, our selfies and SnapChats. If we had possessed this marvelous technology back then, would we have taken more pictures? Or was the paucity of pictures a reflection of our age and outlook? We were 21, and maybe we thought we would be the way we were forever. Why capture moments that you thought were timeless, that you would always remember? As we’ve gotten older, as we moved into middle life and had children, of course, we realized how quickly the stream of time really moves. As the current moved faster and faster, whirling us towards our Sixties, we took more and more pictures and videos to try and capture, to stop in time, those precious moments fleeting by us. Now, holding this Polaroid in our hands, we relive a single instance in time. The past arises fresh out of our memories. And, for a moment, time stops.